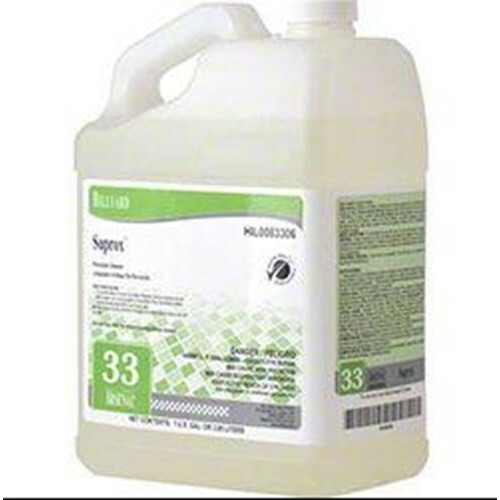 This versatile, highly concentrated multi purpose cleaner contains stabilized Hydrogen peroxide and natural citrus solvents to provide highly effective cleaning for many surfaces including glass, restroom fixtures, tile and grout, counters, floors, and carpets. The Hydrogen peroxide formulation in Arsenal Suprox also aids in brightening grout, enhancing the appearance of tiled surfaces. When compared to traditional multi purpose cleaners, Arsenal Suprox has been formulated for reduced toxicity to lessen the impact on environmental health, worker health, and building occupant health. Dilution rate 1 oz per gallon.